Alliance offers cloud-based VoIP solutions at attractive prices. Its services are geared towards small and medium-sized businesses with about 20-50 users. The California-based company owns its technology and is able to troubleshoot and fix any type of problem with their system. Alliance provides a complete range of phones and conference devices to help maintain a smooth communication channel within your company. They have easy payment plans and their devices are easy to set up and use. All their plans come with rich PBX features and fulfill all crucial business requirements. They don’t cater to residential clients so that they can completely focus on businesses and their needs. This plan is for a 1-3 person team at $29.97 per month for each user. This plan is for a 4-20 person team at $24.97 per month for each user. This plan is for a 21-100+ person team at $19.97 per month for each user. A free trial is offered as well as a 30-day money-back guarantee on all their plans. In the free trial, you can get a free phone number and unlimited calling for 30 days. Alliance is designed for small to medium-sized businesses. While its services are open for large businesses as well as small startups, they are ideal for teams of 20-50 people. All the features of their devices are designed to provide reliable and uninterrupted service. Porting generally takes 5-10 business days and they provide a temporary number for that duration of time. As a result, there is no downtime for the actual numbers that are being ported. Alliance offers 2 to 12-line business IP phones, conference systems, analog phone adapters as well as routers. They have models from Cisco, Polycom, Grandstream, Yealink and their phones come pre-provisioned. Their proprietary softphone is under development, but they recommend using X-Lite and Zoiper on Windows and Mac, and Bria or Linphone on iPhone/Android. You can set them up using the Alliance Provisioning Server. The choices offered by them include a complete range of features and capabilities for all types of businesses. Users get to use the company’s online portal along with remote system management and call management services. Users get to have complete call control along with inbound and call forwarding options. Users can also set your own call rules by restricting some calls while prioritizing others. Users can get optional call recording features and voicemail forwarding. Alliance also offers an automatic attendant that plays music on hold and sends personalized messages that can be scheduled for weekends and holidays. Their VoIP services can be integrated with Google Contacts, Microsoft Outlook, and other platforms. Companies can create user groups and assign certain features to them. Users can also maintain call logs. There is also a fantastic voicemail-to-email transcription feature that transcribes each voicemail into readable text which makes things easier for businesses. Easily create and modify your inboxes and greetings. Access your voicemail from all devices. modify your inboxes and greetings. Access your voicemail from all devices. All devices, digital and analog, can be easily connected to Alliance Phones. You can also rent IP phones and conferencing equipment. Alliance Phones offers the full range of call management features, including call forwarding, automatic call recording, screening, and notifications. When you order their devices, they come pre-provisioned, which means you don’t have to set them up. It’s already done for you. And if you want to use a softphone, they have provided all the instructions online. It’s really easy to integrate the IP phone with your system and if you face any problems, their customer support will help you out. Their software is easy to use and has a clear and minimal interface. Alliance Phones offers the standard help options: 24/7 phone support, live chat, and email support. In addition to an FAQ section, the website has comprehensive how-to guides with pictures as well as a blog, though it is not up-to-date. Customers have been reported being very satisfied with the friendly, polite, and fast response times from customer service representatives. The company offers 24/7 phone support. Chat support is available, however it is unclear if it is around the clock or during certain hours. The company representatives can be reached via email. An FAQ page is available, however it is somewhat limited. Alliance Phones has a blog but it is not updated, with the most recent post from 2013. If you’re a small-to-medium sized business looking for a phone system, Alliance can offer you the perfect solution for your needs. Since they have their own technology, they can troubleshoot and maintain their system quickly. They don’t have any annual contracts, which means you can cancel anytime if you’re not satisfied with their services. They have a flat fee system, and it’s easy to scale up or down on their services. Amazing! TJ went above and beyond to ensure a smooth transition and help us activate our account as soon as possible. They also have incredibly fast and professional support team! Adding numbers and extensions happens in a matter of minutes. Alliance Phones have competitive pricing! But what we liked most was receiving all our voicemails and faxes to our emails as well as making/receiving business calls on our smartphones via the mobile app. Please help me. I am just getting started can u help me out? 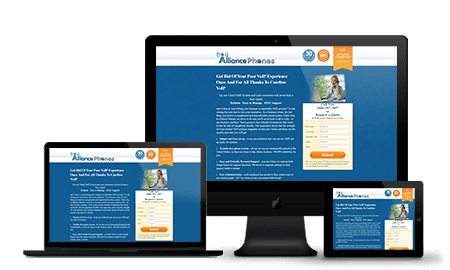 If you're looking to get set up with a new VoIP system, you can contact Alliance Phones directly and they'll be glad to help you out. We also have a helpful selection of articles on our website that may answer some of your questions. Take a look! Will I be able to access this type of phone service from any room in the house? Yes of course! As long as you have internet connection, you can access it from any room.